I’m delighted to once more have my friend and fellow writer DB Jackson on the blog for a series of not-terribly-serious interview questions! 1. Let’s start with the obvious. Give me the ten-cent shake-down on A PLUNDER OF SOULS. The Thieftaker Chronicles are historical urban fantasy, and the books tell the story of Ethan Kaille, a conjurer and thieftaker (the eighteenth century equivalent of a private detective) living in pre-Revolutionary Boston. Each book is a stand-alone mystery set against the backdrop of a particular historical event leading to the American Revolution. The historical events are real, as are many of the characters; I’ve inserted fictional murders into the historical narrative, along with a cast of characters who comprise Ethan’s social circle and clientele. 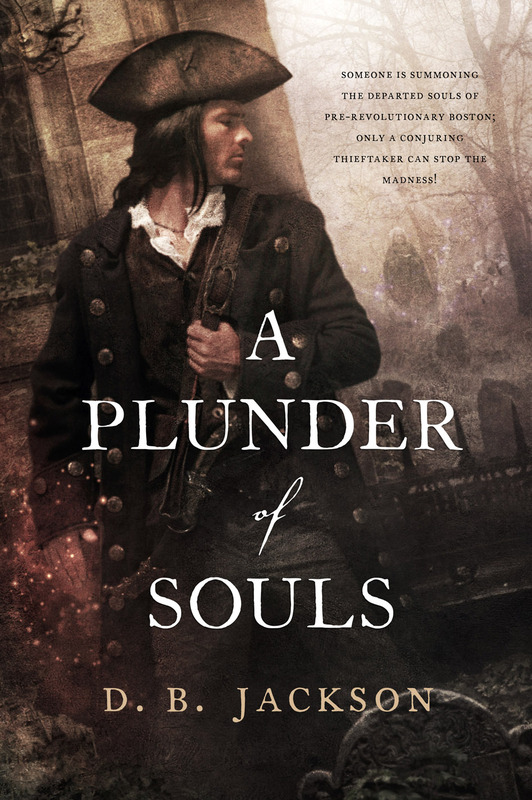 In A PLUNDER OF SOULS, the third book in the series, I bring back a character who is to Ethan something like what Moriarty was to Sherlock Holmes. Nate Ramsey, first appeared in “A Spell of Vengeance,” a short story I published at Tor.Com in June 2012. Ramsey is a fun character, in kind of the way that Hannibal Lecter is a fun character. Like Ethan, he’s a powerful conjurer. He’s also brilliant, cruel, vengeful, and a bit mad. In the original short story, Ethan is hired to protect two merchants who have been threatened by Ramsey. Ethan does his best, but Ramsey gets the better of him, with tragic results, and then escapes Boston. Now Ramsey is back. It’s the summer of 1769, and Boston is in the midst of an outbreak of smallpox (as it really was that summer). Ethan is hired to investigate a series of grave robberies, and soon discovers that corpses have been mutilated in grotesque ways, and that at least some of what has been done to them seems to be meant as a personal warning to him. What results is a little bit mystery, a little bit ghost story, and a whole lot of epic magical warfare. I won’t reveal more, except to say that Ramsey is an even more formidable foe for Ethan now than he was in 1763, when the short story took place. 2. I personally claim to never ‘cast’ my novels with actors, although there are instances where that is untrue. Do you ‘cast’ people for your characters? Anybody you want to confess to? I’ll admit that there are times when I do this. I don’t like to because, as you have said to me in the past, it’s sometimes counterproductive to put such a specific image in the minds of our readers. But there have been characters who just lend themselves to this sort of thing. And the truth is, it can also be fun to imagine the movie versions of our books. So, that said, I can definitely see Sephira Pryce, Ethan’s beautiful and deadly rival in thieftaking, being played by Olivia Wilde. Wilde is gorgeous and alluring, but there is also something a bit edgy about her beauty. Hers is not a soft look, and with the right costuming and makeup she could totally make the role of Sephira come to life as I’ve written it. For Nate Ramsey, I think that Michael Pitt would be a really good choice. He totally looks the part as I envision it, and the kid’s got chops. Ethan is a much harder call. I would want a slightly older actor — Ethan is supposed to be in his early forties by this point in the series, and he has lived a hard life. Maybe Ewan McGregor or Clive Owen. Or Mark Wahlberg. I need to think about this one a bit more. 3. If you had one shot with a time machine, what one historical event, place, or person would you want to visit? Wow. I’m not just saying this because of the Thieftaker books. Really. But I would have to choose the period right around the writing and signing of the Declaration of Independence. I have a Ph.D. in U.S. History, and while my doctoral dissertation dealt with twentieth century issues, I found the Revolutionary period fascinating. I guess that’s why, when I finally got around to blending my love of fantasy with my passion for history, this was the period in which I set my books. It’s not just the events themselves that are so fraught with drama and intrigue. It’s also the personalities: Thomas Jefferson and James Madison, Alexander Hamilton and Benjamin Franklin. Brilliant minds; engaging speakers; willful, ego-driven politicians. And they were bandying about ideas from so many sources — Cato, Locke, Hobbes, Pitt, Hume, and others. It was a heady time intellectually as well as politically and militarily. That’s where I’d want to go. 4. I know you like jazz. Who’s one of your favourite artists, or what is a favourite album? Yeah, I’m a huge jazz fan, and I listen to a lot of instrumental jazz when I work. I know that some authors can’t have any music at all going when they write, but I find that the improvisational quality of the music actually fuels my creativity. In particular, I’m a fan of “cool” jazz from the late 1950s. My favorite artist from this time — no surprise here — is Miles Davis, and my favorite albums of his are KIND OF BLUE, ‘ROUND ABOUT MIDNIGHT, and MILESTONES. Among more recent jazz artists, I love the work of Roy Hargrove, Nicholas Payton, and a relatively obscure, but truly excellent group called Sphere. All of them remain true to the spirit of that older jazz sound, placing a premium on melody, virtuosity, and improv. It’s great stuff, and as I say, listening to it actually helps me write. [Laughing] Well, if you’d slow down with the writing a bit I could at least catch up with the series!! I’ve read the first two books in the series and am now reading COYOTE DREAMS, and loving it so far. My reading time these days is eaten up by books that I read as a beta reader for friends, or so that I might give a cover blurb. Time for pleasure reading is not always so easy to come by. It also didn’t help that I got totally sucked in to your Negotiator trilogy, which also took up some time. (I know that there are more Negotiator books now, but I have my fingers in my ears and I’m saying “la, la, la, la . . .” really loudly so that they don’t distract me.) In all seriousness, I am totally psyched to read the rest of The Walker Papers and get working on our story. It’s going to be a blast. And by the way, HIS FATHER’S EYES, the second book in the Case Files of Justis Fearsson (forthcoming from Baen Books — book I, SPELL BLIND, comes out in January) is finished and turned in. So I’ll be sending a copy of the manuscript your way so that you can read it! Ed: 1. Olivia Wilde & Clive Owen totally work for me for those characters. Or Sean Bean 10 years ago, for that matter. 2. I don’t know much jazz–far less than I should, because I love it–but my god, KIND OF BLUE. What an album. What an album! 4. For the readers: David’s got a new urban fantasy series coming out, I’ve already read book 1, we’re gonna be doing a Walker Papers/Fearsson Files crossover story, it’s gonna ROCK! D.B. 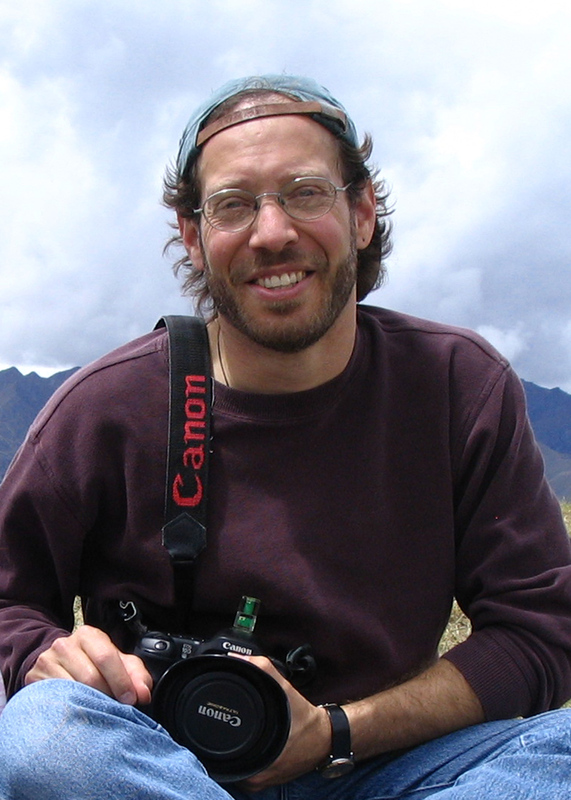 Jackson is also David B. Coe, the award­winning author of more than a dozen fantasy novels. His first two books as D.B. Jackson, the Revolutionary War era urban fantasies, Thieftaker and Thieves’ Quarry, volumes I and II of the Thieftaker Chronicles, are both available from Tor Books in hardcover and paperback. The third volume, A Plunder of Souls, has recently been released in hardcover. The fourth Thieftaker novel, Dead Man’s Reach, is in production and will be out in the summer of 2015. D.B. lives on the Cumberland Plateau with his wife and two teenaged daughters. They’re all smarter and prettier than he is, but they keep him around because he makes a mean vegetarian fajita. When he’s not writing he likes to hike, play guitar, and stalk the perfect image with his camera.